This electronic puzzle consists of a ball with 12 large buttons on it, arranged symmetrically like the faces of a dodecahedron. Each button has a light in it as well. It is very similar to the Lights Out puzzle, in that by pressing the buttons the pattern of lights changes. The aim is to switch on all the lights. Two opposite buttons: Switches the Orbix on and off. Two adjacent buttons: Switches between the 4 types of gameplay. The lights will flash between 1 and 4 times to show which type. Two other buttons: Switches the sound on or off. 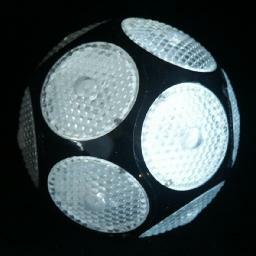 The Orbix was patented by Uwe Meffert on 15 October 1996, US 5,564,702. Uwe Meffert's pages. He produces and sells this puzzle, the Pyraminx, Megaminx, Skewb, and many others. Meffert's page also contains some move sequences for game type 1-3. David Joyner's page. Some of the maths behind the type 1 puzzle. If you press any button, the 5 adjacent lights will change; switch on if they were off and vice versa. This is a very simple type of game. Like Lights Out and Rubik's Clock, this is one of the few puzzles in which the order that the moves are performed is unimportant (i.e. the puzzle positions form an Abelian group). This means that it is not necessary to press any button more than once during the solution because we could change the order of the moves so that repetitions occur together. Since pressing a button twice will not change anything, a button need only be pressed at most once. There are 12 lights, and each light can be switched on independently from all the others. There are therefore 212 = 4,096 positions, and at most 12 button presses are needed to solve it. Of course many of the positions are similar because rotations/reflections of the whole puzzle have not been taken into account. In Sloane's On-Line Encyclopedia of Integer Sequences these are included as sequences A080559, A080560 and A080561. The table shows the number of positions there are for each number of moves. In this case the numbers are simply the binomial coefficients, because of the nature of an Abelian group i.e. because the move order does not matter. The third column shows the number of positions if rotations are taken into account, the last if both rotations and reflections are taken into account. For the mathematics of such a game, see the Lights Out Mathematics page, and for the theory behind counting positions see Burnside's Lemma on the Useful Mathematics page. Simply press a button if an even number of the adjacent buttons are lit. Repeat this until the puzzle is solved. This type of game play is the same as type 1, except that only lit buttons can be pressed. Pressing an unlit button has no effect on the lights. A simple computer search shows that 2079 positions are attainable, and that it can always be solved in at most 10 button presses. In Sloane's On-Line Encyclopedia of Integer Sequences this is included as sequence A080562. There are 4 lights on; two adjacent lights and the two on the exact opposite side of the puzzle. Just press any light and continue. This is exactly 10 presses from being solved. There are 6 lights on; all the lights in one hemisphere are lit, the other half is unlit. Just press any light except for the central one, and continue. This is exactly 8 presses from being solved. There are 6 lights on; three adjacent lights (in a triangle), plus three lights which are adjacent to only one of the other three. Just press any light and continue. This is exactly 8 presses from being solved. There are 4 lights on; two separate sets of adjacent lights. Note that this time (unlike case 1 above) one pair does not lie exactly opposite the other. Just press one of the lights for which the button exactly opposite is lit, and continue. This is exactly 6 presses from being solved. There are 8 lights on; two adjacent buttons are unlit and the two on the exact opposite side of the puzzle are also unlit. Just press any light that lies adjacent to both sets of unlit buttons and continue. This is exactly 6 presses from being solved. With this type of game play only unlit buttons can be pressed, and then all buttons EXCEPT the adjacent ones change. Pressing a lit button has no effect on the lights. A simple computer search shows that all positions are attainable, and that it can always be solved in at most 12 button presses. In Sloane's On-Line Encyclopedia of Integer Sequences this is included as sequence A080563. Solving this is very similar to type 2, except that now you only press unlit buttons, and the number of lit neighbours must be alternately odd and even. I do not know of an easy way to determine what the parity of your first move should be, odd or even. Simply choose any first move, and from then on alternate the parity. If you have done 12 moves and still have not solved it, then you must have started wrong. You may also come upon a position where there are no moves of the parity you are looking for. There are 2 lights on; two on exactly opposite sides of the puzzle. This is exactly 4 presses from being solved. There are 6 lights on; two adjacent lights are on, all those adjacent to either of these are off, and the remaining 4 are on. This is exactly 4 presses from being solved. There are 8 lights on; three adjacent buttons (in a triangle) are off, and one on the opposite side of the puzzle is also off. This is exactly 6 presses from being solved. There are 6 lights on; three adjacent buttons (in a triangle) are off, and the three on the exact opposite side of the puzzle is also off. This is exactly 8 presses from being solved. There are 10 lights on; two non-adjacent non-opposite buttons are off. This is exactly 8 presses from being solved. There are 6 lights on; a ring of 5 lights are on, and the one non- adjacent light is also on. This is exactly 10 presses from being solved. There are 6 lights on; three adjacent lights are on, and the three buttons adjacent to two of the first three are also on (these six form a large triangle). This is exactly 10 presses from being solved. There are 10 lights on; two opposite lights are off. This is exactly 12 presses from being solved. Find any unlit button, and check whether it has an even or odd number of lit neighbouring buttons. If the last move was even, then find any unlit button which has an odd number of lit neighbours, and if the last move was odd then find any unlit button which has an even number of lit neighbours. You have done 12 or more moves. You must have chosen the wrong parity to start with, so do a move of the same parity as the last one and go back the steps c-d to try again. You are in a position that is not one of those listed above, but has no move of the parity you are looking for. You must have chosen the wrong parity to start with, so do a move of the same parity as the last one and go back to steps c-d to try again. You are in a position that is one of those listed above. Do any move, and go back to steps c-d to continue, keeping in mind that the next move will need to be odd. With this type of game play only lit buttons can be pressed. If the button opposite the pressed one is on then the effect is as type 1/2, i.e. the adjacent 5 lights change. If the button opposite the pressed one is off, then all buttons except the pressed one change. Pressing an unlit button has no effect. In Sloane's On-Line Encyclopedia of Integer Sequences this is included as sequence A080564. This shows that all positions can be solved in at most nine moves, except of course the position with no buttons lit which is impossible. The following method is not the fastest, but it will solve the puzzle fairly quickly. If fewer than half the buttons are lit, then press any lit button which has an unlit button opposite. Now at least half the buttons are lit. If there is any lit button with a lit button opposite, and with fewer than 3 lit neighbours then press it. This increases the number of lights that are on further. Repeat step b as long as possible. If all the unlit buttons have a lit button on the opposite side of the puzzle, then each of the unlit ones can be solved by pressing its opposite twice, and then the button itself once. Two adjacent buttons and their opposites are off. Find the two buttons that are next to both the adjacent unlit buttons. Press them, and go back to step b. One unlit button and its opposite are unlit. Press any button adjacent to an unlit one to light it up, then press the originally unlit button itself, and go back to step b. Two adjacent unlit buttons, and one unlit button opposite. Press the lit button opposite one of the unlit buttons, and go back to step b.